It can create an optimized terrain database, which is a compressed, multi-resolution, stream-optimized file (MPT) from all your source information and applied manipulations in the TerraBuilder project. 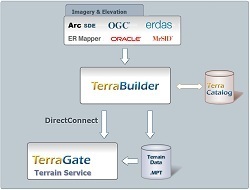 The terrain database is used locally or published by TerraGate to Internet or intranet users. It, together with the DirectConnect component, can stream aerial and elevation data, in their native formats (e.g., ECW, Mr. SID), directly to TerraExplorer clients. This eliminates the need to create an MPT 3D database, saving time and resources and enabling you to create on-demand databases.